Do you spoil your pups during the holiday season? I won’t even deny it; we are all about spoiling during the holidays in this household. Our girls get to enjoy holiday treats like the rest of us, starting from Thanksgiving all the way to New Year’s. If it isn’t us, it is the grandmas making sure the girls have lots of wonderful treats and toys (especially when it keeps them from table surfing). The hardest part, however, is making sure we have quality, healthy treats available without spending a small fortune. 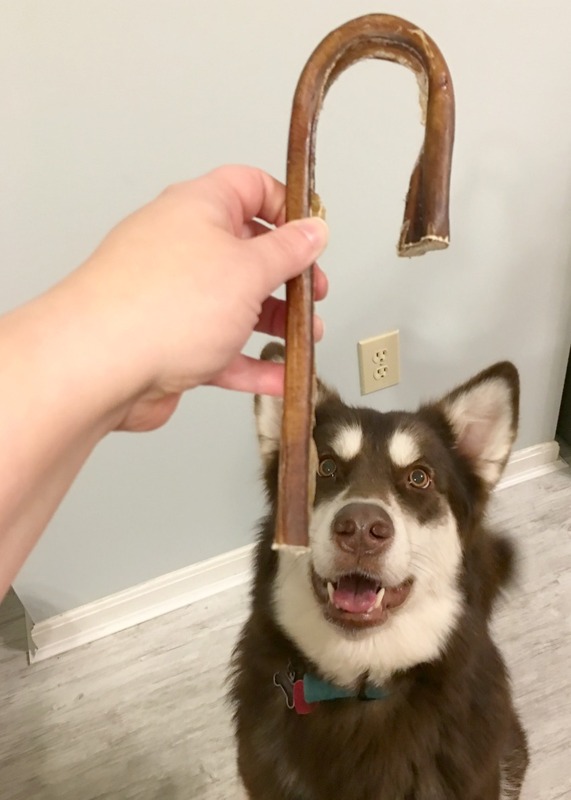 As I was looking for fun gifts for two cute malamutes, I was approached by BestBullySticks.com asking if I would be willing to review a complementary Abominable Snowman Box for my girls. 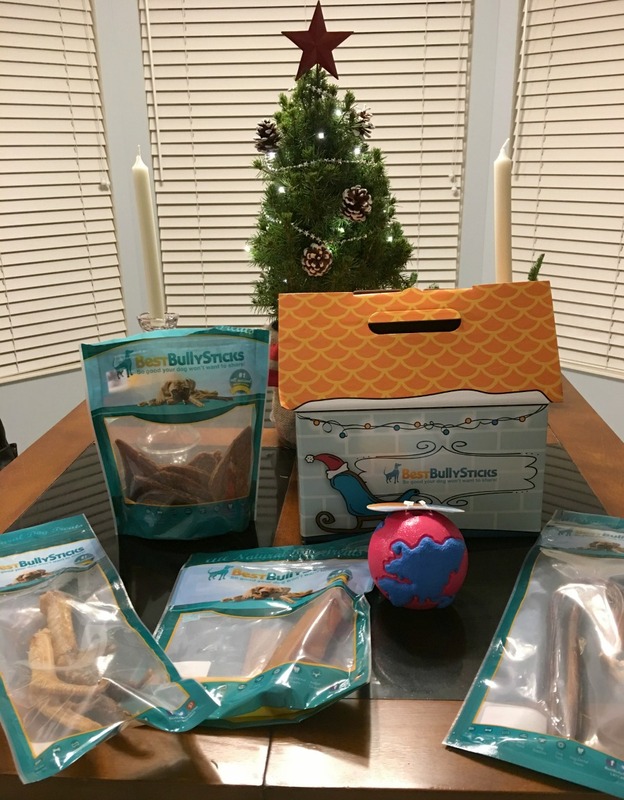 After looking at the site and the quality of their products, I thought they sounded like a good fit for our family, and couldn’t wait for our holiday box to arrive! Abominable Snowman Box: What is It? Looking for a holiday dog box filled with treats and chews specially chosen for large breed dogs? If so, we think you will love the Abominable Snowman Box. This fun box features a variety of natural treats suited for large dogs that are 100% digestible and made from an assortment of meats to complement your dog’s daily diet. Along with fun treats, it is has a fun ball perfect for burning off those extra calories with a hard playing session. With the themed gift box that comes with the set, it is perfect for putting under the Christmas tree or just surprising your favorite dog this holiday season! When our box first arrived, I will admit, I was truly surprised by the size of it. Sure, I knew there was a lot in the box but I’m not used to even things meant for ‘large’ dogs being appropriately sized for my malamutes. One thing that was certain – my girls knew this box was for THEM. They were circling the table and trying to figure out how they could get a closer look at all the goodies inside. 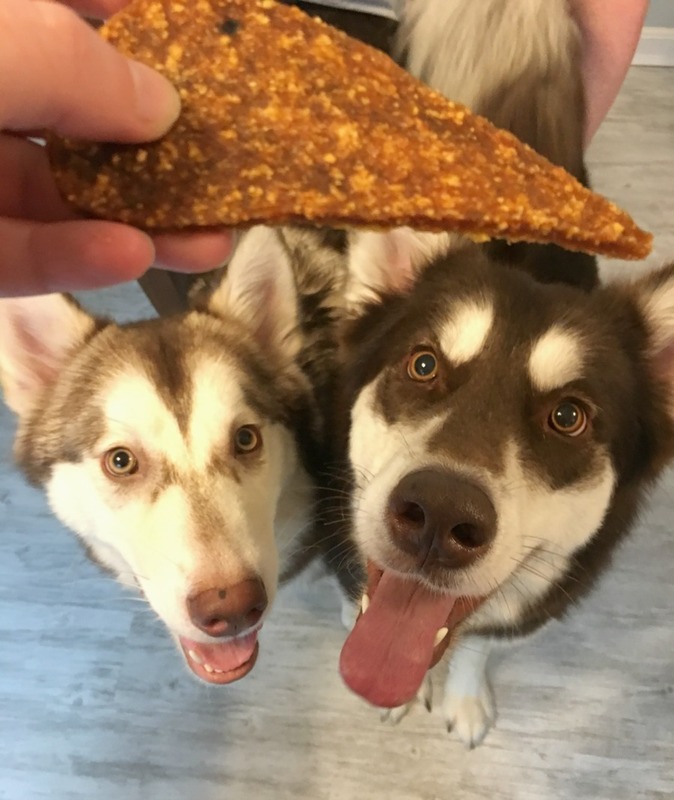 From what we have seen, each of the treats drive them absolutely wild, with their favorites having to be the duck fillet dog treats and the Himalayan cheese chew (always a favorite in our household, but these seemed particularly large – a good thing!). Fair warning though, the duck fillets absolutely drive dogs wild. Our girls were so wild to get one they did not want to listen to commands – they just wanted it NOW. After some calming we did MUCH better but our dogs absolutely LOVE these fillets. Everything else in the box was a hit, with Rylie enjoying the turkey legs (Ivi, of course, couldn’t with her allergy). Overall, I will say this box was a major hit in our household. Based on our own experience, I am delighted to give the Abominable Snowman Box an A+ rating! Abominable Snowman Box: Where to Purchase? Would you like to purchase this box for your own pup? You can find the Abominable Snowman Box on BestBullySticks.com for only $46.12 (with free shipping too!). Don’t need a large box? Don’t worry! They have boxes for small and medium size dogs too! For small dogs they have the Tiny Tim box ($30.29) and for medium dogs, the Jack Furost box (32.43)! One thing is for certain though; dogs everywhere will love getting one of these boxes this holiday season! Want to learn more? 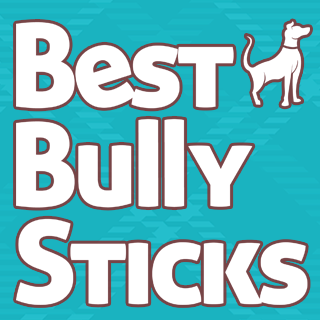 Follow BestBullySticks.com on social media! 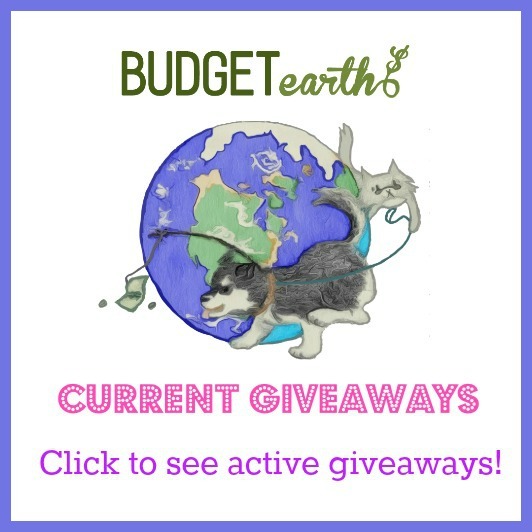 Disclosure: Budget Earth did not receive monetary compensation but did receive products in exchange for this post . This post may have affiliate links. All opinions on this product are my own and may differ from our readers’ opinions. Nice looking box of yummies for the dogs, I think the treats are great and healthy for them. That is a great box of gifts. I think I will be a nice gift for my sister. Thank you for the review. This is a really nice box of treats.You get so much for your pet.I want to try one of these. We don’t have a large breed dog anymore. Our current dog is smaller and older and doesn’t care much for toys. However my sister’s boxer would have a field day with this box! That was a great box of yummy treats. I get a kick out of the Bully Stick Candy Canes. What a great idea! My dogs would love this! My furbaby would love this. She says yum yum yum. Haha. She is a sweet girl and deservbes treats like this. My dogs would really like these, I think. They look fun and it looks like you get a lot for the money spent. My father has three pitbulls who love to chew chew chew and this box might be the perfect Christmas gift. Believe it or not, they’ve even figured out how to chew on the wood flooring! I really like that the boxes come in several sizes for the specific needs of your sized pet. My dog has allergies so I like that the treats are all natural. It would make a great gift for my shepherd/husky. What awesome boxes of goodies for a four legged family members. My “kids” love treats so I know they would love these as a Christmas gift. I just started giving my boys bully sticks. They love them, and they keep them busy for a while. Yes! I spoil my doggie around the holidays, but honestly, I spoil her every day. She would be so excited to receive these big treats! this is awesome. dogs are so smart and feel so left out. mail for the furbabies! These look great. My sister Michelle has a puggle and my sister Jessica has a dachshund! They would love the small and medium boxes. Thanks for sharing your honest opinion about this great company. Merry Christmas! kristiedonelson(at)gmail(dot)com Thank you. That looks like a great box for dogs. Healthy too. I may check on it.Our dogs need something for Xmas to. What a cool box for dogs! My two dogs would absolutely LOVE all of those treats! A very fun way to spoil them, I love it! WOW!! look at the size of these treats, I would be begging for one lol, I love that they put a lot of thought into making these. I would love to win this for a rescue shelter, Saving Grace, in central NC. Your dogs are gorgeous! Roxi would be heaven but I know that the difference in our pictures would be the drool hanging out of her mouth. She gets so excited when she knows a good girl treat in coming up and I think she would really like these. Thanks for sharing! Aw bless my poor old dog that I took in as a stray. 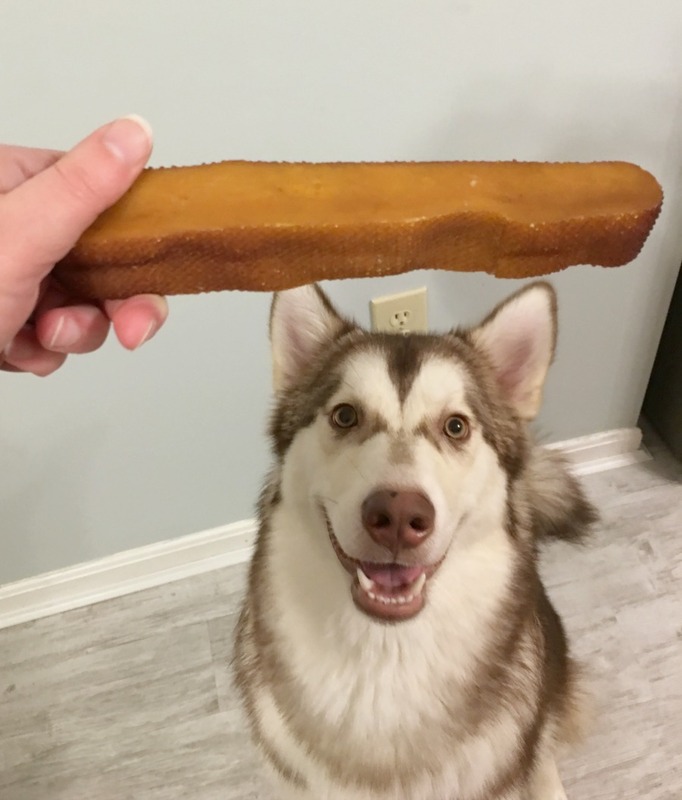 He’s just the sweetest baby and would be so excited to have treats like this. My dogs would love this. There’s enough treats in it for all of them. Oh man! This box would definitely drive my pups wild. They love ALL those things. So cool! My dogs would LOVE this box. I’ve tried this company before and have somewhat mixed reviews, but they dogs like their stuff and would love to get a box like this. Your dogs are precious, they have that same look our little dog has when a treat is being held over his head. They seem to know the difference when you are giving them a treat, its like they can hear the bag rustling. I have 2 dogs that this would be great for. I have a small dog that can have weird bellys and a puppy so smaller stomach good to be all natural for them. What an adorable doggie box! I love the Christmas theme of this one, the candy cane bone is too cute! 🙂 I would definitely order this for our new puppy. Thanks for your review! It’s always fun to find new things for our dogs. We have three large dogs and they would enjoy this. I think they’d go nuts over the duck filet treats. My dogs would definitely love these dog treats. They would be begging and wagging their tails like crazy. My dogs always look forward to their treats everyday. My dogs would love the candy cane dog treats. This holiday box would help me spoil my dogs this Christmas. Your dog were great reviewers. This box of goodies would make any dog happy. Everything is irresistible to them!